Can you do the Django? There is something about the Restaurant Week format, with the typically smaller number of dishes being prepared by the kitchen staff in restaurants across the city that tends to lend the meal somewhat of a conveyor-belt feel, or at least that’s the opinion that I’ve come to after numerous experiences. There have been relatively few Restaurant Week meals that I’ve been utterly satisfied with, so much so that I don’t make the effort to plan to go out to eat when the time comes. But that said, there are a few places where I’ve had really excellent Restaurant Week experiences, and Django is one of those. This small, homey, almost French provincial BYOB near 4th and South Streets is definitely all that its been cracked up to be. When I ate there for Restaurant Week about a year and a half ago it was definitely impressed by the quality of the food they were turning out and I was not disappointed on a return visit last evening. Since I had been so impressed with the meal in the rather more constricted Restaurant Week format, I really wanted to go back to see what the kitchen was preparing on your typical Saturday night. I have to say that one of the things I really appreciate about Django is how they embrace the feel of home and charm in both their food and decor. 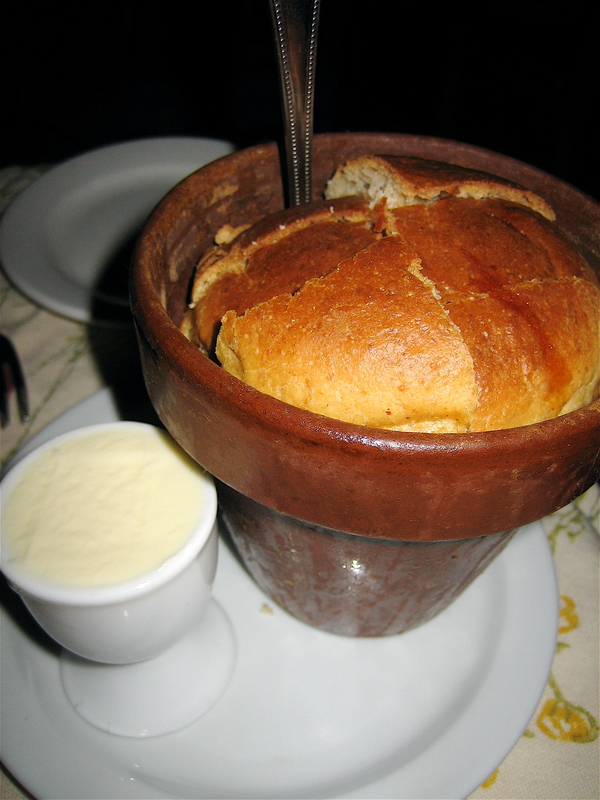 I mean any place that serves you bread baked in a flower pot has got a lot going for it from the get go, right? The menu was filled with wonderful choices of seasonal, fresh, local foods (they change their offering frequently) that in their mere description made you want to gnaw on the paper menus, but then that could just be me. I would really have loved to be able to try one of everything, but we wouldn’t have been able to fit all that food on our tiny little table, not to mention the fact that I wouldn’t have been able to fit all that food in my stomach. My dinner companion and I decided to split an appetizer and two entrees and a dessert. 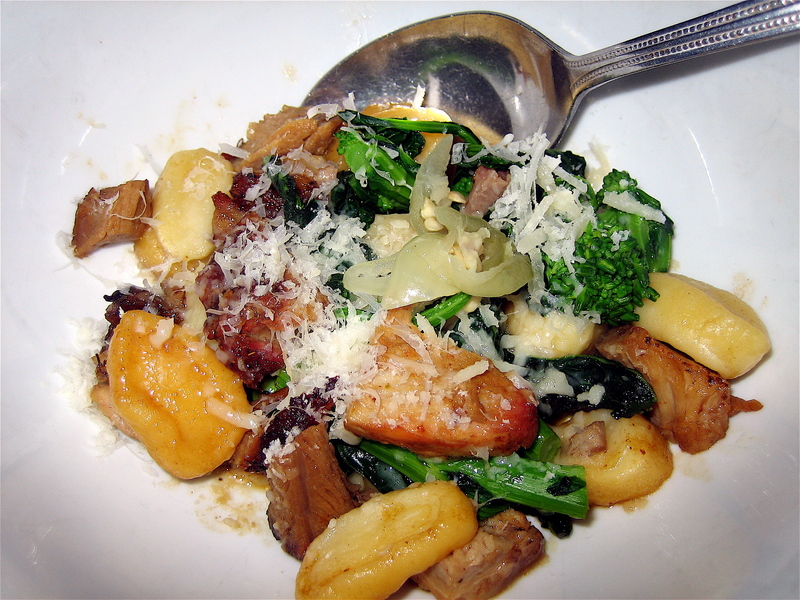 We started with a goat cheese gnocchi with house made porchetta (a boneless pork roast), broccoli rabe and sweet garlic, topped with aged provolone and served with long hots jus. These were not your typical Italian BYOB gnocchi, they had a firmer texture than I was used to, but this was a better accompaniment to the porchetta texture-wise. I was surprised by the pungency of the au jus, which almost tasted beefy in origin. The broccoli rabe was a definite success. I may have mentioned on here somewhere before how difficult it seems to control the bitterness in broccoli rabe, it can often get to be way too overwhelming, but in this dish, that was certainly not a problem. 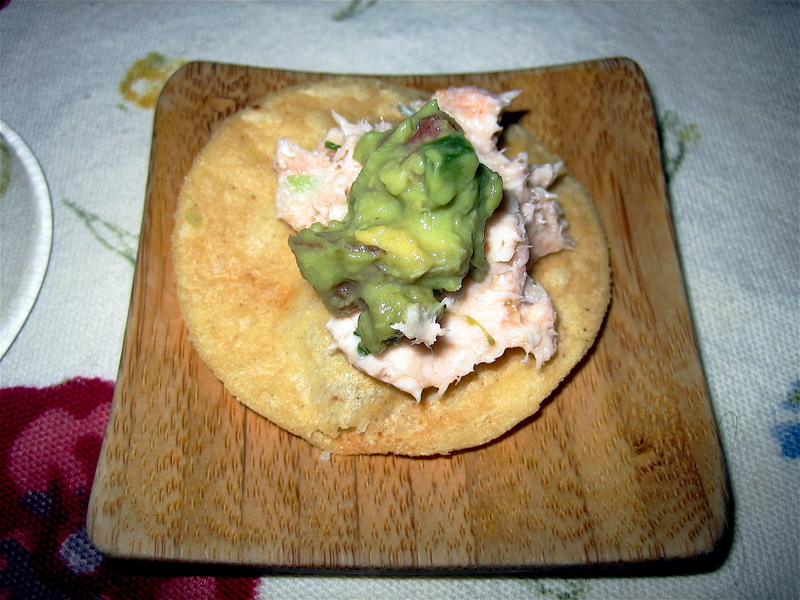 They surprised us with a little amuse bouche of smoked salmon pate and spicy avocado spread on top of, get ready for this, a round tortilla chip. I laughed when I realized that’s what the base was, I could just picture the servers in the back pawing through a bag of tortilla chips picking out the unbroken ones for the guests and chomping through the others if / when they could steal a spare moment. This was a surprisingly tasty little treat though, so don’t knock it until you’ve tried it. 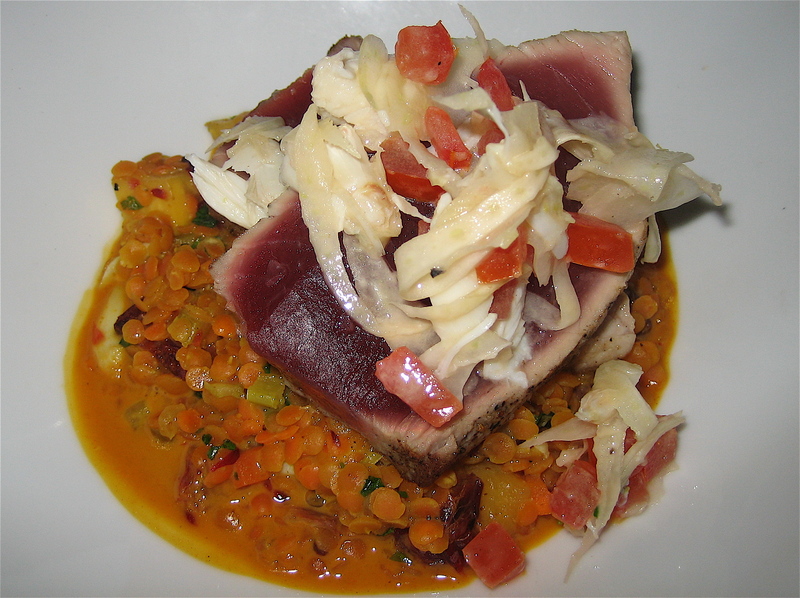 For one of our entrees we ordered a seared rare Hawaiian Big Eye Tuna with pink lentils, peaches, crab and basil in blood-orange and coconut curry broth. This was a definite flavor success! I love anything with coconut in it and since peaches are just starting to come into season, they lent a really wonderful freshness to the whole dish. I am personally still working on my love for lentils, I think I need to start making them more often at home. It’s mainly a texture dislike for me, I prefer smooth and mushy rather than grainy and crunchy. The appearance of this dish alone, however, was enough to impress, I mean carrying on the theme of the pinkness of the rare tuna throughout the other aspects, it was definitely a keeper. The other entrée we ordered was an organic duck breast served with an arugula, cherry, and goat cheese salad, a confit-goat cheese cigar, a foie-gras torchon, and a port-cherry reduction sauce. I really appreciated the fact that they left the skin on the duck breast and I loved the foie-gras. 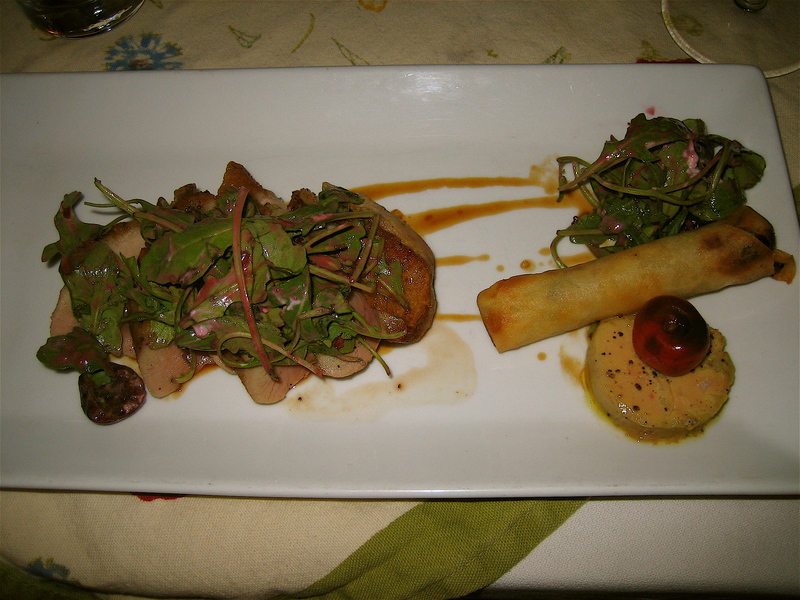 Something about duck breast and foie-gras, the chewy meaty texture and the silky smooth, goes so well together. I did think that they could have played up the cherry part of this dish a little bit more, the flavors were a bit flat for my taste and I felt that if they’d either had a few more dried cherries in the port reduction or fresh ones in the salad, then it would have brightened up the flavors just the right amount. Ah, to dessert, my perpetual favorite. We all know that Django is and has been known for their cheese plates and they definitely still have them on their menu, but no amount of polite hinting would convince my dinner partner that they wanted to try this, so we ended up going for the strawberry-rhubarb shortcake with an almond biscuit, vanilla cream fraiche, lavender honey and whipped cream. I do believe that this is the first time I’ve ever had a strawberry rhubarb shortcake and I really did not know what I had been missing. This was wonderful! The almond biscuit was light but also with some crunch and the whipped cream with honey was heavenly. 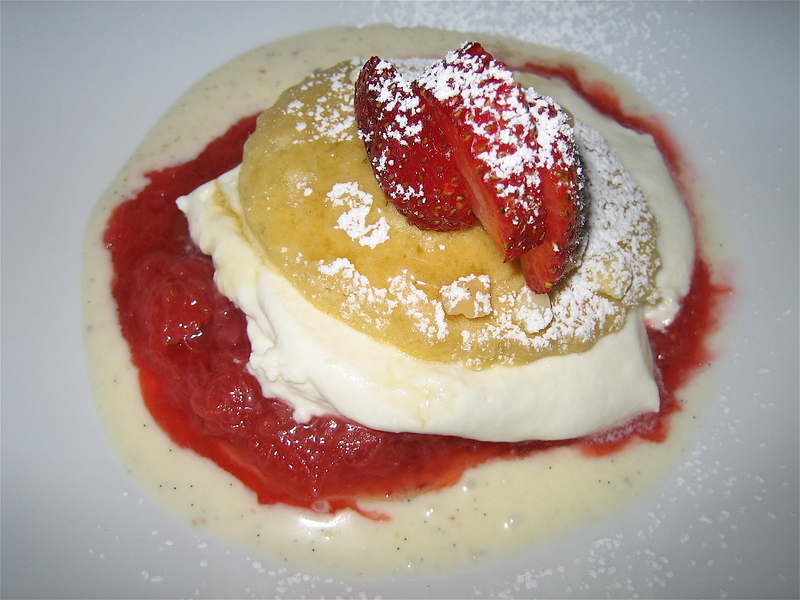 This entry was posted on July 7, 2008 at 1:00 am and is filed under Food, restaurant review. You can subscribe via RSS 2.0 feed to this post's comments. You can comment below, or link to this permanent URL from your own site.